Prime Minister Stephen Harper gave an evening address to say Canada would not be intimidated by Wednesday's "brutal and violent attack" in Ottawa, in which an armed attacker fatally wounded a Canadian Forces member at the National War Memorial before being shot dead in Parliament's Centre Block. Prime Minister Stephen Harper said in an evening address that Canada would not be intimidated by Wednesday's "brutal and violent attack" in Ottawa, in which an armed attacker shot and fatally wounded a Canadian Forces member at the National War Memorial before being shot dead in Parliament's Centre Block. The slain soldier is Cpl. Nathan Cirillo, 24,a reservist from Hamilton. 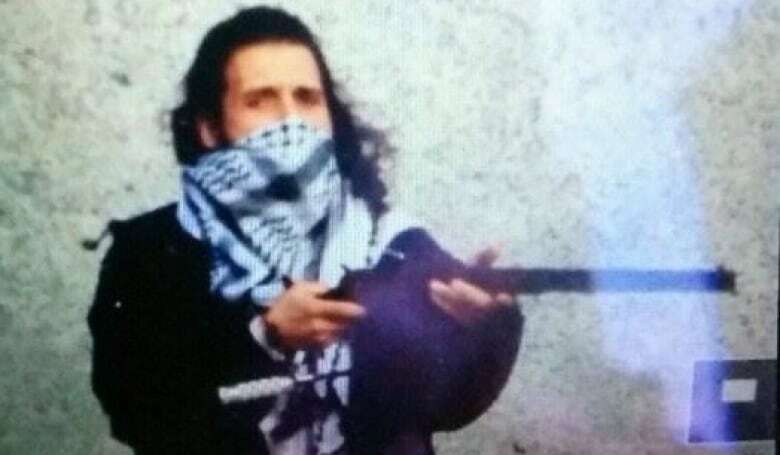 Michael Zehaf-Bibeau had criminal record in Quebec, B.C. 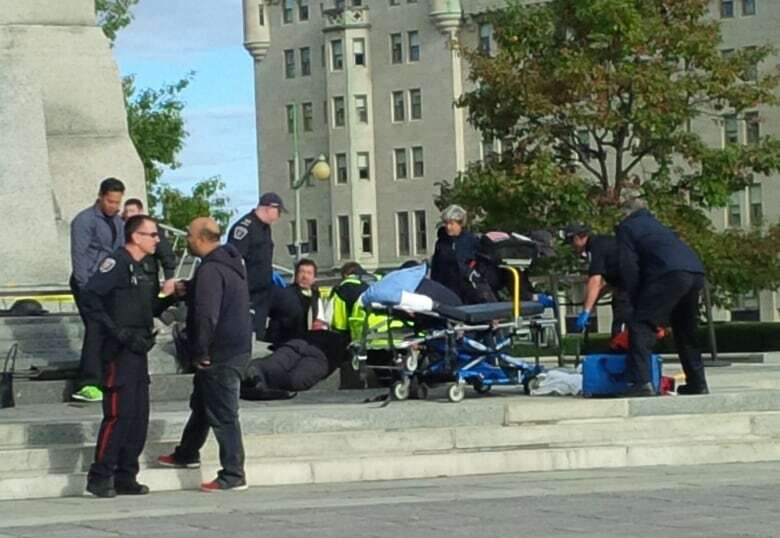 Moments after Cirillo was shot at his post by the Tomb of the Unknown Soldier, MPs and other witnesses reported 30 to 50 shots fired inside the main Parliament building. It was confirmed later that the gunman was shot dead inside the building, felled by the House of Commons sergeant-at-arms and RCMP, according to MPs' accounts. CBC News has confirmed the dead shooting suspectis Michael Zehaf-Bibeau, a Canadian born in 1982. CBC News has learned that Zehaf-Bibeau has a criminal record in Quebec dating back 10 years on some drug-related charges. Court documents from that time show that he lived at an address in Montreal. He also has a criminal record in B.C., where he was convicted in 2012 of uttering threats and served one day in jail. In his brief address, Harper offered condolences for Cirillo's family, and for the family of Patrice Vincent, another soldier who was killed in an attack earlier this week. "For the second time this week, there has been a brutal and violent attack on our soil," he said. "But let there be no misunderstanding — we will not be intimidated, Canada will never be intimidated." NDP Leader Tom Mulcair andLiberal Leader Justin Trudeau delivered their own statements, condemning the attacks and pledging support for the government. Harper, who was on Parliament Hill at the time of the shooting and was safely whisked away, met with members of his cabinet before making his address. He then met with the Conservative caucus, who had been in lockdown on the Hill until after 8 p.m. ET. Harper's spokesman Carl Vallée said on Twitter that Harper also spoke briefly to U.S. President Barack Obama on Wednesday afternoon. Harper also spoke with Mulcair and Trudeau, the Prime Minister's Office said. Hundreds of people, including children at a daycare, waited hours to be evacuated from Parliament Hill as the area remained under lockdown. 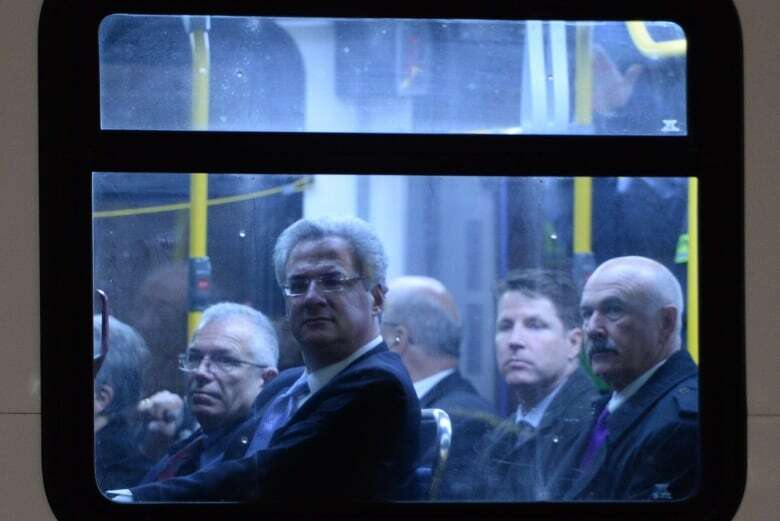 Late Wednesday OC Transpo buses began taking people away from the Hill as the lockdown eased. In an afternoon news conference, police would not say whether they still suspect another shooter is involved, saying only "there is no one in custody at this time." "This is a dynamic and unfolding situation," said RCMP Assistant Commissioner Gilles Michaud, commanding officer of the national division. Michaud also suggested that police had no forewarning of the attack, saying "it caught us by surprise." He added that it's too soon to say whether the dead gunman was already known to security officials. Michaud added that police have maintained a "medium" level of security of Parliament for the past number of years, and that had not changed in recent days. Ottawa police Chief Charles Bordeleau asked witnesses to the incidents to come forward. Ottawa Civic Hospital confirmed four people were taken to hospital: the soldier who died, and three who were released after treatment for minor injuries. One of those injured was a parliamentary security guard shot in the foot, according to CBC's Judy Trinh. Despite earlier reports of shots fired near the Rideau Centre shopping mall east of Parliament Hill, police later said "no incident occurred near the Rideau Centre." Alain Merisier, who works at the cafeteria in one of the Parliament Buildings, told CBC News that he saw a man in a car at the Centre Block with a long gun. CBC video and cellphone video shot by a Globe and Mail reporter showed a chaotic scene in the elegant hallway leading from the front doors of Parliament's Centre Block to the Library of Parliament during the attack. A sustained volley of shots was fired. Startled security personnel and political staff scrambled to take cover in the limestone alcoves as bullets flew. NDP MP Craig Scott: "MPs and Hill staff owe their safety, even lives, to Sergeant at Arms Kevin Vickers who shot attacker just outside the MPs' caucus rooms." Veterans Affairs Minister Julian Fantino, former head of the Ontario Provincial Police and ex-Toronto chief of police: "I am safe & profoundly grateful to Sgt at Arms Kevin Vickers & our security forces for selfless act of keeping us safe." Justice Minister Peter MacKay: "Thank God for Sgt at Arms Kevin Vickers & our Cdn security forces. True heroes." Earlier, police sealed off the area around the National War Memorial while the injured soldier was given emergency medical aid. "We were waiting there for a city tour and suddenly I heard four shots," said Jan Lugtenborg, a tourist visiting downtown Ottawa from Holland. "Suddenly I saw a small guy with long black hair … with a long rifle, and he ran away after the shots, across streets in the direction of Parliament Hill," he said. Raivo Nommick, another bystander, said "all of a sudden, I just heard a shot, turned around and there was a guy with a rifle .... and just pow pow. "Then I saw one of the other Armed Forces guys just running. He barrelled over, just ran right over. The other guy just dropped. I looked back and just dived underneath and immediately called 911." Scott Walsh, who was working on Parliament Hill, said he saw a man running with a double-barrelled shotgun, wearing a scarf and blue jeans. Walsh said the man hopped over the stone fence that surrounds Parliament Hill, forcing someone out of their car at gunpoint. He then drove to the front doors of Parliament and fired at least two shots, Walsh said. New Democrat MP Hélène Laverdière said she heard 20 to 30 shots inside Parliament, and hit the floor. 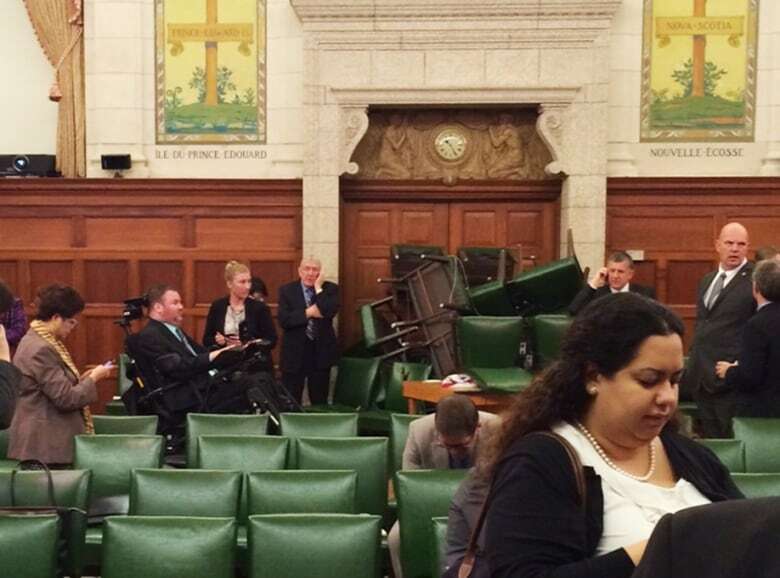 She and fellow MPs Charlie Angus and Rosane Doré Lefebvre were later led out of the Centre Block to safety. MP Doré Lefebvre worried about getting her daughter from the daycare facility on Parliament Hill. Children from the daycare were not released until about 8 p.m.